A city is only as good as its music. That’s why Philadelphia is so lackluster - it only has me sitting on the banks of the fountains at Rittenhouse Square, strumming for the masses with enough anxiety to fill a library during Georgetown’s final season. Of course, I’m only joking. Philly is filled with sounds, whether musical or from a car honking at a notorious Philly jaywalker. Although I’ve only street-performed a few times, the legendary Las Ramblas performers have seen it all. It’s their livelihood - maybe they perform for a few hours after their gig at the coffee shop, or maybe they do it to scrape all of their Euro moneras together for an entrepan at Conesas. Walking through the Gothic Quarter of Barcelona gave me a chance to witness some street performers perforate the air with harmonic melodies of acoustic guitar riffs and call-and-response violin. 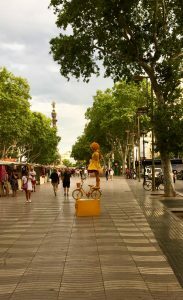 Las Ramblas was covered with stoically silent artists dressed in metallic costumes, assuming poses that seemed impossible to stay in for more than a few minutes without getting a serious cramp. Using the metro at five in the morning did not afford us weary travellers a peaceful journey; a bearded man had set up a rock concert in the stations’ maze-like tunnels. When you see a busker, you must make a decision. Will you ignore the strange sight, or bask in the wonderful sounds? Will you give a gratuity to the artist? Do you even have any cash on you? As a street-performer, I understand what it’s like to watch feebly as people move on - you must move someone enough so they stay to watch. Watching these artists make it look easy on the streets reminds me of how hard it truly is, and how I may not deserve to street-perform as a privileged, college-enrolled individual who could just be taking a nice pitch away from a busker who is in desperate need of cash. 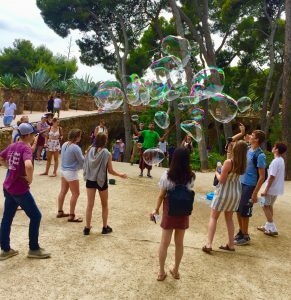 Then I happen upon a man who makes his living through blowing giant bubbles in Parc Guell, and I am reminded how the streets are ours to share. With laws becoming ever-stricter as cities threaten to tear the street-performing livelihood away, I find it refreshing when I come across a busker with nothing to lose and the world to gain. I wonder if they would tip me if they saw me in Philly, if I would be enough to capture their attention. Barcelona has reinvigorated my passion for bringing music to the streets and smiles to locals and tourists alike. 1 Comment to "Buskin’ in Barcelona"
Such a lovely piece, Samar. Free and fresh and musical. I hope you’re enjoying Spain!